Father Winter is already making his angry presence known across the east and mid-west this week. The first major snowstorm of the season hit hardest around the Great Lakes and parts of New York, burying some places with more than 6 feet of snow. Its bad enough that the National Guard had to be called in to the Buffalo area and over 100 miles of the New York State Thruway had to be closed, trapping a college basketball team on a bus for more than 24 hours and counting. Not to mention the many truck drivers stranded or severely delayed on their deliveries. 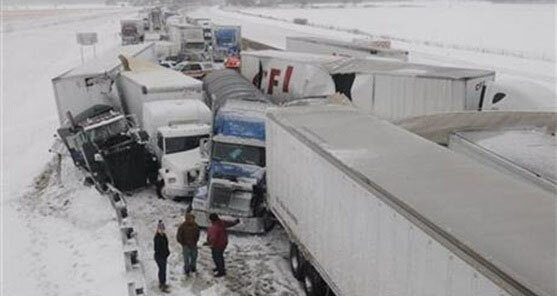 With such a large part of the Interstate 90 closed, its been causing major problems for truck drivers from all across the country and the thruway remains closed until further notice. Many truck drivers in the Erie region have been making themselves at home for the last few days at the Travel Centers for America in Harborcreek. Some are also getting hit with major added fuel costs up after taking 80-mile plus detours as they try to travel all across the country. Truck driver George Copeland has been trying to make his way to Oklahoma City and says that this winter weather has been a driving nightmare trying to travel with his oversized haul. He already knows there is no way he will be able to get his freight to Oklahoma City on time. The National Weather Service said that as of Tuesday night, some areas around Buffalo were already accumulating up to 76 inches of snow since the storm started on Monday. It’s actually the highest record for snowfall over a 24-hour period anywhere in the U.S., ever. "This is a very intense storm, one of those record storms that we are going to remember for a few years beyond this date," Buffalo Public Works Commissioner Steven Stepniak said. As the temperatures struggle to climb above freezing in most of the Northeast, the Midwest is suffering even worse cold. The wind chill made it feel closer to zero or even colder in parts of Illinois, Wisconsin and Minnesota. The severe cold has been already been blamed for causing at least 19 deaths from traffic accidents related to icy roads. At least three deaths were also caused by weather-related heart attacks and the death of a 16-year-old boy from exposure in Nebraska. Meteorologists call it an “Omega block”, and so far there is no sign of it releasing its cold grip at least for a few days. Have you been affected by this early winter weather? Share your story in the comments below.